Last week I introduced Timmy and his parents, Joe and Rita Sims. I illustrated that Timmy was an all American kid with dreams and aspirations just the same as you and I. Timmy had all the talent to become a great high school athlete and had potential to become a great college athlete as well; all provided he put in the right work and effort towards his goals. Picking up where I left off, Timmy had finished football season and was ready to move on with the rest of his freshman year. Still guessing at which classes to take he moved swiftly through winter basketball and into spring baseball having successful 1st seasons with both teams; given his athletic abilities this wasn’t a surprise to many. Learning slightly from his mistakes with JV football he has his parents start filming his games. His parents were very big supporters, going to every game and cheering loud for their boy. Sometimes this made filming rather difficult but they stuck through the process. At the end of Timmy’s freshman year Joe and Rita thought it would be best for Timmy to spend his summer having fun with his friends from the neighborhood as he has done every summer for many years. 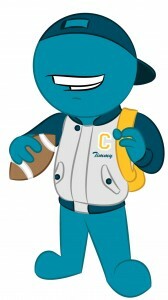 Timmy’s coaches had other plans for Timmy in hopes he might become a varsity athlete his sophomore year but Timmy delighted in the idea of taking a break from sports and enjoying a couple months off. As directed with this series, please take notice of the mistakes that Timmy and his family have made in this segment of Timmy’s high school and recruiting experience. Tell us in the comment section which mistakes you have found and how you personally would have done things differently if you were in Timmy’s shoes. This week’s segment featured 5 mistakes made by Timmy and/or Timmy’s parents, did you find them? Also, I included 1 positive decision in this week’s segment as well, did you notice it? As written at the top of each week’s lesson, please find and correct Timmy’s mistakes in the comment section of the blog! Correction- Although having dreams of being a professional athlete are great and quite popular among youth today, the possibilities are also a LONG SHOT. It is great to have dreams but solidify those dreams with a good solid reality as well. In this case Timmy should have a backup plan in case professional sports don’t work out. Correction- It’s always a good idea to understand your strengths. This is difficult as a freshman but is a good idea to have thoughts in your mind about which sport you would want to play in college. Correction- Timmy’s parents should have done a better job of managing their son’s “dreams.” They should re-enforce the power of education and let Timmy know if he works hard and has luck on his side then MAYBE professional sports will work out; if they don’t he has a solid education to work off of. Correction: Even as an incoming freshman you and your family need to have set goals in place understanding what classes it will take to become a college student-athlete. Accomplish this by educating yourself with information found in the NCAA Guide for the College Bound Student-Athlete and speak with a guidance counselor. Correction: Again, even as a freshman statistics are extremely important as they tell your journey as an athlete each year. If for some reason you have great stats one year and the next not so great, there’s a story there. The same goes for someone who progressively gets better each season and can show that through numbers. Correction- Similar to keeping statistics, it’s wise to have film that shows your progression as an athlete. This film can also help you to get invites to camps and showcases you might not get otherwise. College sport. Video streaming replacing cable. Do you have questions about your recruiting? Leave them in the comments below of find us on Facebook or Twitter.